Failure analysis for 2.5D/3D chips; nanowire sensors. Imec has developed a new failure analysis method to localize interconnection failures in 2.5D/3D stack die with through-silicon vias (TSVs). This technique is called LICA, which stands for light-induced capacitance alteration. It addresses the reliability issues for 2.5D/3D devices in a non-destructive and cost-effective manner at the wafer level. For some time, the industry has been developing 2.5D/3D stacked die using interposers and TSVs. In the process flow, however, the TSVs may end up with opens and shorts, sometimes referred to as faults. To find the problem, the industry requires an assortment of failure analysis methodologies. Failure analysis makes use of analytical tests to understand issues or problems in the flow. It is used to boost the quality and reliability of a chip or a package. Generally, for failure analysis, the industry uses microscopy and X-ray tools, but many of these are destructive techniques. There are several non-destructive techniques, such as magnetic field imaging, lock-in thermography and electro-optical terahertz pulse reflectometry, according to Imec. These tool types are expensive and not available in many labs, however. To address the need for a cost-effective failure analysis technique, Imec has devised LICA. LICA requires a scanning laser microscope, a probing station and a capacitance meter, according to Imec. LICA utilizes the effect of light on TSV capacitance, which locates or pinpoints defects on the device. In other words, the electrical capacitance of the TSV changes when the structure is illuminated with light or a photocapacitance. In operation, a scanning focused laser beam hits a 2.5D/3D TSV structure. A light-induced change in electrical capacitance is measured. The location of the defect is marked when a change in the capacitance is seen. “By scanning the focused laser beam over the chain, and applying a differential capacitance measurement technique, Imec researchers have been able to successfully localize the open defect in the structure down to a single TSV. The required measurement time to localize the defect was less than five minutes. We expect that the analysis time can further be reduced to less than one minute by instrumentation optimization,” said Imec postdoctoral researcher Kristof J.P. Jacobs, in the R&D organization’s monthly publication. Using a nanowire process, a European R&D project has developed a new pressure-based fingerprint sensor technology for high security and ID applications. The project, dubbed PiezoMAT or PIEZOelectric nanowire MATrices, enables a fingerprint sensor resolution of more than twice as high as currently required by the U.S. Federal Bureau of Investigation (FBI). The 44-month, €2.9 million research project was funded by the European Commission in the Seventh Framework Program. Its partners include Leti, Fraunhofer, Centre for Energy Research of the Hungarian Academy of Sciences, Universität Leipzig, Kaunas University of Technology, Specific Polymers, Tyndall National Institute and OT-Morpho. 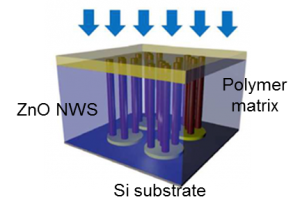 The group demonstrated that a matrix of interconnected piezoelectric zinc-oxide (ZnO) nanowires grown on silicon can reconstruct the smallest features of human fingerprints at 1,000 dots per inch (DPI). With the technology, the group fabricated a sensor with 250 pixels and its associated electronics for signal collection and post-processing. The project also provided know-how in several key areas, such as optimization of seed-layer processing, localized growth of ZnO nanowires on silicon substrates, mathematical modeling of complex charge generation, and synthesis of new polymers for encapsulation.